Build a platform to protect the tent from water and snow on the ground. Living in a tent requires the ability to adapt and thrive in a new environment. Tent living does not provide the comforts of a traditional home, but the option is viable in a variety of climates. Tent living is ideal in temperate climates, but customized tents allow you to live in cold environments. The tent must be capable of handling the worst weather you will face without collapse. A quality and spacious tent is the top choice for year-round living, and the addition of several features will ensure your survival and comfort. Erect the tent in an area with natural cover such as trees with a thick canopy. The cover provides shade and protects the tent materials. Create a tarp canopy over the tent for additional protection against rain and the elements. Line the interior of the tent with bug netting to prevent infestations. The bug netting also allows you to occupy the tent with the doors open for airflow and temperature control. 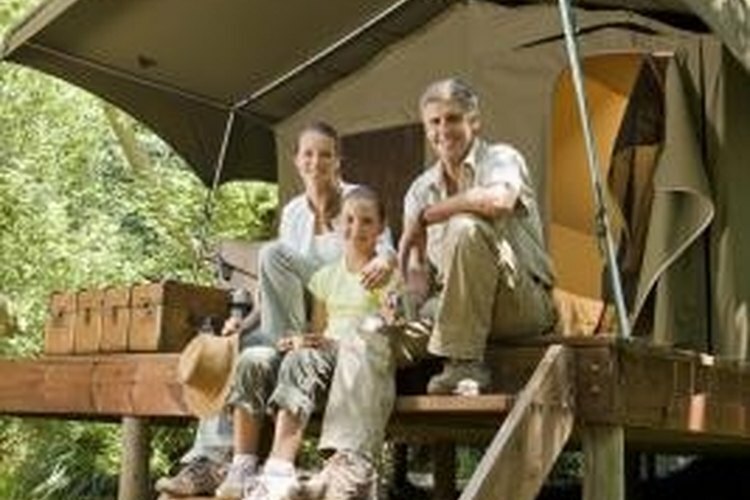 Also, purchase a tent with a sewn floor to prevent insects from entering through the floor. Build a deck-style platform for the tent to increase airflow and prevent mold in humid climates. Hose the outside of the tent with water one time per week to wash away matter that might create mold. Inspect the tent regularly to ensure it remains clean and safe. Cook on a gas grill to minimize the need for local wood resources. Wood is ideal for warming and cooking in cold climates, but gas is much easier to manage and is used effectively outside of the tent. Use rope to tie reflective insulation panels inside of the tent. The insulation is not mandatory, but it saves energy by reducing the amount of fuel required to heat the tent. Install a wood stove in the tent for cooking and heating. Split at least five cord of firewood before the winter to ensure you will remain warm. Erect the tent in an area with additional firewood resources to replenish your stock throughout the winter. Dress in layers to minimize the amount of heat required inside of the tent. Also, create a warm bed with numerous layers of blankets and sleeping bags. The extra warmth isn't always necessary, but it creates an emergency system in case the wood stove fails. Store a large supply of water near the stove. Water stored outside will freeze and might ruin your storage container. Truck water into the site before the winter or utilize a water source near the tent. Freshwater streams and catchment systems work well for the minimal water required in tent living. Build a platform deck for the tent to ease the snow management and maintenance. The platform creates the opportunity to quickly remove snow from the roof and sides of the tent. It also raises the tent away from rodents and animals. Also, use a tent with a sewn floor to prevent rodents from tunneling under the tent walls. Pay for a gym membership to gain access to a warm shower. You can shower at the tent site, but the water usually is cold and the conditions are uncomfortable. Store an emergency food supply for tent living in remote environments. Food, water and warmth are the main areas of focus for surviving at a remote tent site.